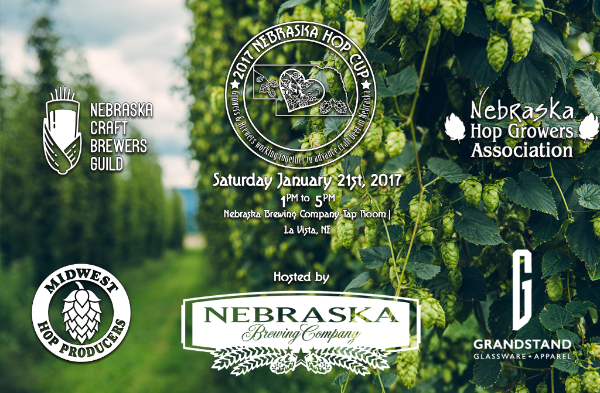 Nebraska Brewing Company is proud to host the 4th Annual Nebraska Hop Cup, a craft brew competition to benefit the Nebraska Hop Growers Association (NHGA) & the Nebraska Craft Brewers Guild (NCBG). The event will feature 14 Competing Nebraska Breweries and their uniquely crafted beer made with 100% Nebraska grown hops. A 'People’s Choice' competition will take place on Saturday, January 21st, 2016 at the Nebraska Brewing Company Tap Room (6950 S 108th Street, La Vista, NE 68128). Tickets for the event are $25 per person and the event will run from 1pm to 5pm. For the first 3 hours, attendees will be treated to four-ounce samples of each of the competing beers while talking to brewery owners & brewers. Attendees are provided a voting ticket as part of their entry and are able to vote for their favorite to win the traveling "Nebraska Hop Cup". Additional tickets for voting can be purchased at the event for $1. Food will also be available for purchase. Paul Kavulak, President of Nebraska Brewing Company comments: “Nebraska grown hops are maturing to a point where the beers made with them are becoming quite remarkable. Showcasing this perfect blend of Nebraska Hops and Nebraska Brewers illustrates the growth of a strategic partnership. Please join us as we celebrate the growth of our local industry!”. The Nebraska Hop Growers Association (NHGA) exists to promote the growth & use of Nebraska hops as a sustainable crop through education and shared resources for commercial & home brewers. The Nebraska Craft Brewers Guild (NCBG) is a non-profit operating to promote the interests of the Brewer Members, Craft Beer education, and to build awareness of the Nebraska beer industry. Upstream Brewing (Omaha - 2015 Winner). Copyright © 2017 Nebraska Brewing Company, All rights reserved.